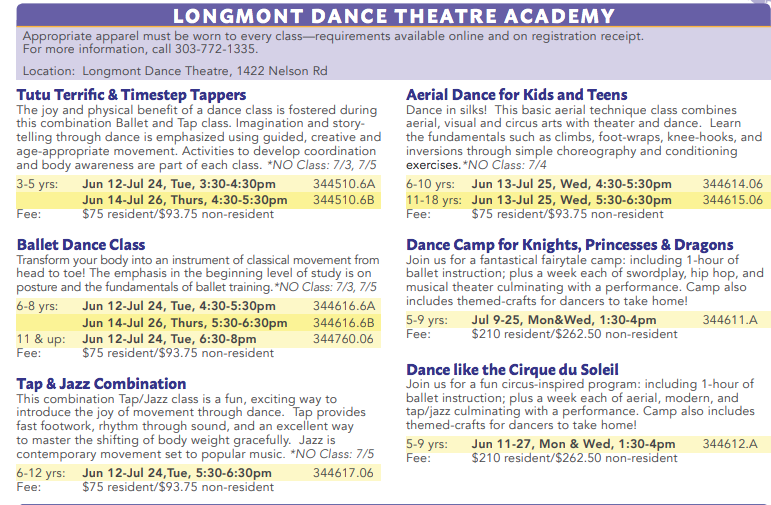 Longmont Dance Theatre Academy collaborates with the City of Longmont Recreation Department to offer beginning dance classes for our community. Please visit www.LongmontColorado.gov to register for Summer 2018 class offerings. Online registration is available beginning Thursday, March 1 for Summer Dance Camps and Tuesday, April 3 for weekly class offerings. Weekly classes are 6 weeks in length. Contact LDT Academy at 303-772-1335 or email us if you have any questions!